A place to post and discuss your own Tolkien inspired art and poetry. I love it! I can't believe this is your first watercolour . Legolas would give those wimpy flower-fairies a thing or two to think about . Nice shades of green and modelling on the cloak. That's not easy to handle and it really gives him movement. Thanks Iolanthe! I had a lot of fun doing it, and quite a learning curve - the picture didn't start out like that (I kind of made it up as I went along) and I'm still not sure how I got those effects on the cloak! I'll show you the original so you can get the full effect (it doesn't look quite the same on screen). And yes, I do have a few ideas I might be able to work on . . .
"And so they stood on the walls of the City of Gondor, and a great wind rose and blew, and their hair, raven and golden, streamed out mingling in the air." Last edited by marbretherese on Wed Apr 11, 2007 8:12 am, edited 1 time in total. Oh, very nice, Marbretherese: I have always loved that image. That's lovely : . I've always loved that image too, and the starry cloak. Good use of subtle, blended colours in the landscape and clouds. It's easy to get that muddied using watercolour and you've handled it very well . Are you sure you haven't done this before? Thanks, ladies! it's one of my favourite images from the book (my very favourite is on pp 166/7 of Alan Lee's Sketchbook ). 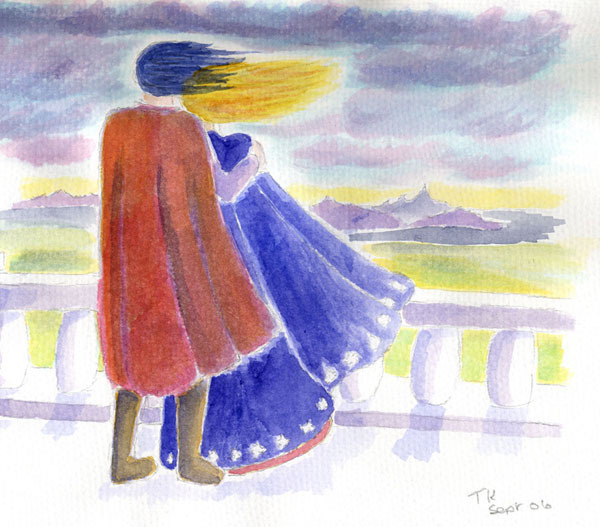 Bizarrely, and despite it's obvious faults (Faramir's hair is blue and the casual observer could be forgiven for thinking he's trying to push Eowyn over the balustrade) this painting freaked me out when I caught a glimpse of it from the left hand side rather than full on - I could almost feel the wind blowing! Now I'm wondering what you were going to put in that Tolkien didn't mention . I'm thinking now that it would be nice to see some more poetry, maybe with an elvish theme. I'm working on a Lothlorien painting but have run into a serious spot of bother . It's quiet on this thread, and I have another painting ready, so here it is. Not as I intended it to look - and not a particularly good one - maybe my efforts will encourage others to come forward with theirs? Last edited by marbretherese on Wed Apr 11, 2007 8:13 am, edited 1 time in total. You underestimate it, I think it's very good! That's not an easy subject or composition to carry off. I love all the colours and the way you've used the paint, and Gladriel's mirror is just as I imagined it with the branches supporting it. Makes me more determined to get my 'Lothlorien' painting on paper instead of in my head. I ran into a spot of bother with the trees...... . I like the background, which is suggestive of trees, etc., without being so explicit as to take away from the foreground. Thanks, marbretherese! I love Lothlorien! So I'm looking forward to your next opus, Iolanthe! Thank you both for your comments! the background (and indeed quite a lot of the rest) came about "organically" (I think that's the word) - that is, they evolved from the artist getting herself into difficulties, as usual. Galadriel has ended up with a slightly sinister air, which I didn't originally intend, but seems to me quite appropriate - I've always found her rather scary. At least it's not twee (unlike my Legolas) - nor does it fall into the pitfall best described by the original spoof working title I gave it: "Galadriel, or the Elven barmaid"
Elven barmaid , you've ruined my vision of it now.....! 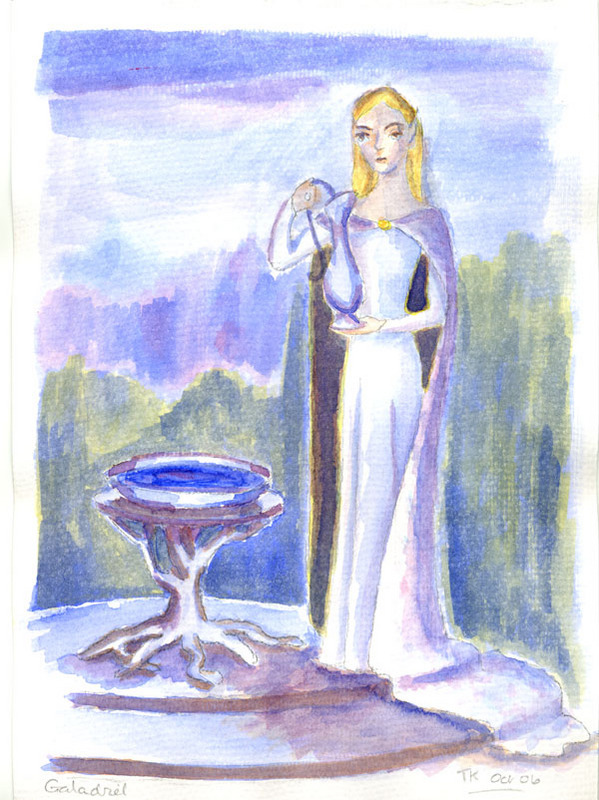 marbretherese wrote: Galadriel has ended up with a slightly sinister air, which I didn't originally intend, but seems to me quite appropriate - I've always found her rather scary. I think you were working with the minds of two scared Hobbits. Remember, she wasn't exactly all lovy dovy to those poor fellows. "What will I see there?"... "I don't know you twit, just look in my mirror I'm bloody nosey!" Between that and the barmaid Galadriel will never be the same again! I had not shared any of my work in a long time but here is one photograph I had named Mallorn Tree.